Dun Scaich is a 14th century stone enclosure fortress, founded by the MacLeods. Standing on the north angle of Ob Garscavaig, its curtain walls encase the summit of a rocky outcrop, that was possibly crowned by an earlier structure. 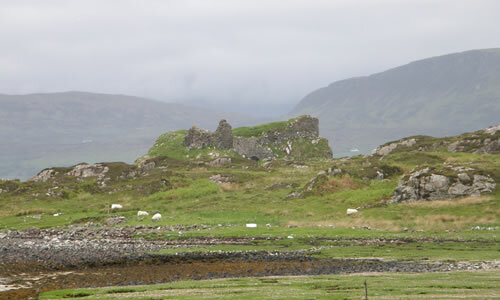 In the early 15th century, the castle was the principal seat of the Macdonalds of Sleat but after a rebellion in 1431 it was occupied by the forces of King James I. In the early 17th century, the Macdonalds moved to Duntulm Castle and the site was probably abandoned. The wide, deep rock-cut ditch that defends the landward approach is crossed by two arched walls that once enclosed a drawbridge. Beyond this is a flight of steps, that gives access to the courtyard and occupying its western edge are the overgrown foundations of a rectangular building. With a possible garderobe in the north-east angle and a sea-gate to the south, only fragments and turf-covered foundations remains of the enclosure walls. 7 miles south-west at Teangue is Knock Castle. Dun Scaich is located on the Isle of Skye, west of Tokavaig off the A851. 22 miles south-west of Kyle of Lochalsh, on the A87-A851.